If a belt does not perform according to the manufacturer’s claims by wearing prematurely, ripping too easily, disintegrating due to excessive heat or because of oil penetration, the risk to life and limb is relatively small. But if a conveyor belt that is specified as being fire resistant catches fire but does not resist the fire the way that it should do then it will literally ‘convey’ the fire throughout the site. The consequences can be catastrophic. Due to the financial pressures, more and more organisations are being forced to examine their day-to-day running costs and, almost inevitably, seek cost savings. The pressure to cut costs seems to be influencing buying decisions concerning fire resistant conveyor belts but is price being put before safety? The discovery that a belt is not sufficiently fire retardant is only likely to be made when it is too late. Anecdotal as well as factual evidence gained from extensive laboratory testing certainly indicates that even some of the biggest users of conveyor belts are using belts that are not as resistant to fire as they are claimed to be. In a growing number of instances, many bulk material handling sites that should be using fire resistant belting are operating with non-fire resistant belts simply in the pursuit of ‘economy’. Fire resistant standards for test methods and specifications applied to conveyor belts are becoming increasingly stringent and can be very confusing. The first and most important thing to bear in mind is that conveyor belts cannot be totally fire proof. Using special additives and chemicals, the rubber used in the top and bottom covers that protect the carcass of the belt and the rubber skim between the fabric plies of the carcass can be engineered to resist fire but the complete structure of the belt cannot be made fire proof. The fabrics used in the carcass of the belt most commonly contain polyester and nylon, which have virtually no resistance to fire. In other words, every belt will begin to burn (and continue to burn) when exposed to a naked flame that has sufficient energy to ignite the belt. What is meant by ‘fire resistance’? Once a belt is ignited by flame then it will continue to burn until it is no longer exposed to the source of ignition. Although commonly referred to as ‘fire resistance’ within the conveyor belt industry, in real terms it is the ability of specifically designed rubber to self-extinguish once the source of ignition is no longer present. EN 12882 is the standard for safety requirements for conveyor belts for general-purpose use (not underground). The most basic electrical and flammability safety requirement is EN 12882 Category 1. For environments where dust or other potentially combustible materials are involved, it is essential that the conveyor belt cannot create static electricity that could ignite the atmosphere. Belts need to be able to allow static electricity to pass through the metal frame of the conveyor structure down to earth rather than allow static to build up. At Dunlop we decided some time ago that the safest approach was for all of our belts to be anti-static and conform to EN/ISO 284 international standards. This means that they can all be used in ATEX 95 (94/9/EC Directive) classified zones. Some people mistakenly believe that all belts used in ATEX classified zones must be flame retardant but actually this is not the case. Because fire safety is such an important issue there are numerous safety classifications and international standards for which there are many different tests used to measure the self-extinguishing properties of conveyor belts. Rubber belts reinforced by layers of textile fabrics (multi-ply) or steelcord reinforcement are the most commonly used type above ground and in general service applications. The basis of most tests for belting used in normal industrial applications is EN/ISO 340. This standard makes the distinction between fire resistance with covers (K) and fire resistance with and without covers (S). The relevance of “with and without covers” is that as belt covers wear during their operational life the amount of fire resistant rubber protecting the flammable carcass reduces. The best way to decide between ‘K’ and ‘S‘ grades is to consider the material being carried. For moderately abrasive materials then ‘K’ grade is usually perfectly adequate. This also applies to elevator belts. However, if the material is abrasive and tends to wear the top cover quite rapidly then the safest option is be to choose the ‘S‘ grade. In both ‘K’ (EN 12882 Class 2A) and ‘S’ (EN 12882 Class 2B) grades, the rubber skim that bonds the fabric layers of the carcass together should also be fire resistant. In the case of ‘S’ grade (fire resistant without covers), the rubber skim should be thicker than the skim used for ‘K’ grade. The easiest way to tell if a ‘K’ grade belt has the required thicker rubber skims is to obtain technical datasheets from the manufacturer for both ‘S’ grade and ‘K’ grades and compare the carcass thickness figures. Another reason why buyers should always request technical datasheets before placing an order is that they include information on the level of abrasion (wear) resistance. The ingredients used to create a fire resistant rubber compound generally have an adverse effect on its wear resistant properties. Consequently, fire resistant belts tend to wear faster and as the thickness of the rubber reduces so does the level of protection given to the inflammable carcass. To avoid premature belt replacement, in the case of purely fire resistance belting, buyers should always demand an average abrasion resistance level of no more than 150mm³. At Dunlop our rubber compound technicians have proved that it is possible to have the best of both worlds by developing a fire resistant rubber that also has good resistance to abrasion. In fact our technicians have created a compound that has 50% better wear resistance than the DIN Y standard for abrasion resistant rubber. This means that the belt retains its resistance to fire for much longer and at the same time extends the operational lifetime by the same proportion. However, laboratory tests have revealed that this is very much an exception to the rule within the conveyor belt industry. The time it takes for the belt sample to self-extinguish is then measured. The duration of continued burning (visible flame) should be less than 15 seconds for each sample with a maximum cumulative duration of 45 seconds for each group of six tests. This factor is of paramount importance because it determines how fire can be effectively carried along a moving belt. The effects of fire being literally ‘conveyed’ to adjoining buildings can be seen in some of the photographs. Even if a manufacturer states that their fire resistant belt has passed the ISO 340 test, the buyer should still exercise caution. A typical conveyor belt can easily travel more than 40 meters within the 15 seconds sufficient for a belt sample to pass the test but which would still allow the belt to carry flames over a potentially dangerous distance. For this reason our required time limit standard in Dunlop is no more than one second, ideally 0 seconds. Buyers of fire resistant belt are therefore recommended to ask to see copies of the test results and to check that the laboratory that has carried out the tests has EN ISO 17025 certification. What standard of fire resistance do I need? 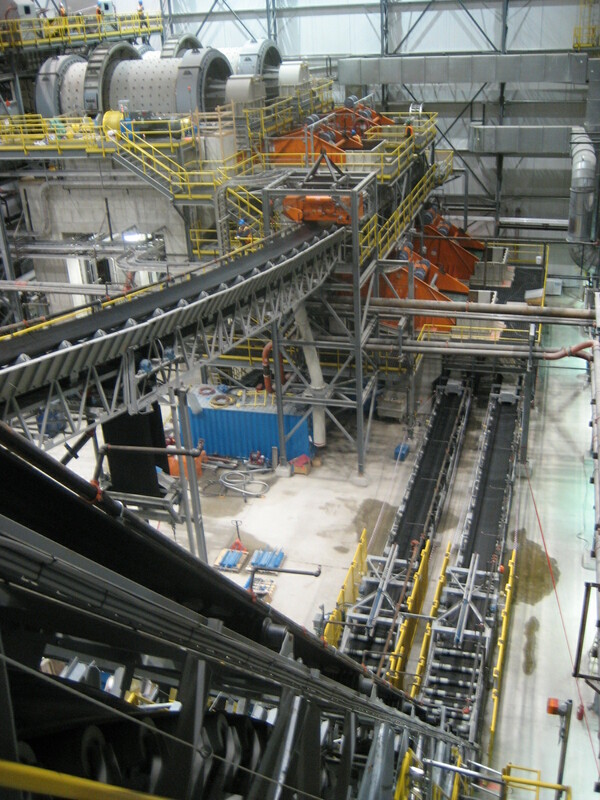 When choosing a fire resistant conveyor belt, establishing the correct level or standard of fire resistance needed for a specific application or environment is of crucial importance. 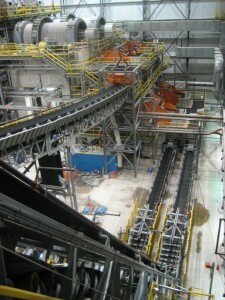 This can present one of the most difficult challenges for users of conveyor belts. For the vast majority of belts being used in the open air, Class 2A or 2B would be perfectly adequate. Class 2A demands that the belt is able to pass the ISO 340 test described earlier with the covers intact on the belt samples (K grade). Class 2B requires that the belt that can also pass the ISO 340 test with the top and bottom cover rubber removed (S grade). As mentioned earlier, the electrical conductivity of the belt also needs to fulfill the requirements of ISO 284. If you are still unsure of the fire resistant grade of belting needed then it is best to carry out an internal risk assessment. If the expertise for this does not exist within your company then there are a number of external organizations (and almost certainly your insurers) that can perform this function for you. 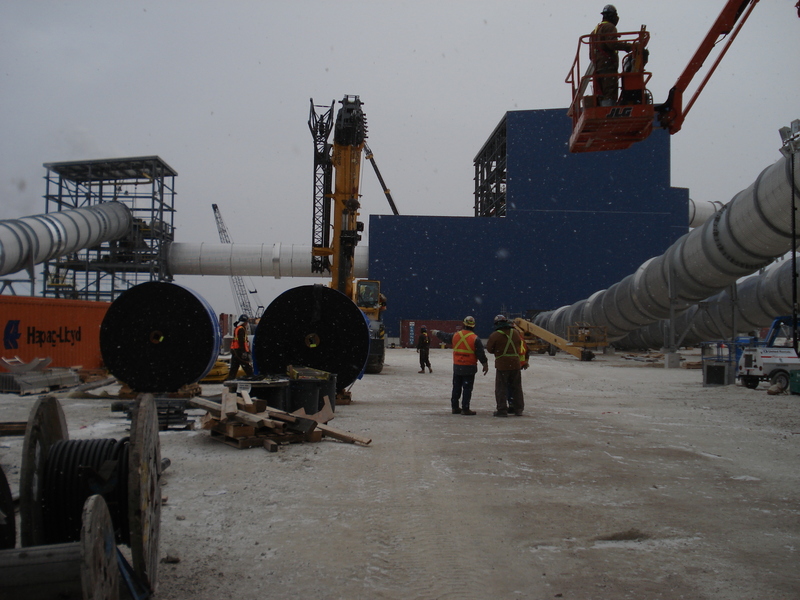 For conveyors carrying materials that contain oil such as wood chips and biomass (some types can spontaneously combust), rubber compounds that are resistant to fire, abrasion and oil are available. There are, of course, two types of oil resistance – mineral and vegetable. This is yet another important consideration when deciding on the correct type of fire resistant belt so buyers are recommended to be very specific when making requests for quotations from manufacturers and suppliers. Such tests can easily cost up to 20,000 euros or more. For the manufacturers of solid woven underground mining belts and steelcord belting this is not a particularly big problem because there are a relatively small number of different belt types that have to be supplied for testing in large quantities. Although the test certificates are valid for several years, these large-scale tests present a huge and costly problem to manufacturers of rubber belting for above ground use because there is a much wider range of belt types. Such complex test methods have made it extremely difficult to develop improved levels of fire safety because if a belt sample fails the tests then the technicians have to go back to the drawing board to make further changes to the rubber compound and then embark on another round of expensive tests. Apart from hindering development of fire resistant belting, it also means that it is very difficult to adequately test those belts that manufacturers claim reach specific levels of fire resistance. This is one of the reasons why there are so many end-users operating conveyors fitted with belts that provide totally inadequate levels of fire safety. The problem has long been recognised by the CEN standards committee and over recent years they have been trying to find a solution. Following recent meetings attended by technical experts from all over Europe, the Committee European de Normalization will be introducing several positive changes in 2014. Agreement has been reached on using and adapting tests already in existence for quality standards such as DIN and BS that will involve much smaller scale tests using much smaller equipment. This will mean that major manufacturers will be able to experiment and carry out testing in their own laboratories. Ironically, these new test methods will actually be even more demanding than the old, large-scale tests. Major insurance companies are already showing interest and are becoming involved in discussions. For them, and for all genuinely safety conscious organisations, this can only be very good news. Although manufacturers and suppliers may be able to provide test certificates, in some cases the certificate may only relate to the belting that the manufacturer produced for test certification purposes. In reality, the actual belt delivered to site may well not be up to the required standard. For greater peace of mind we would suggest ordering an extra meter of belt and then have that piece of belt tested by an accredited testing authority or laboratory. The author: Sytze Brouwers is the Chief Application Engineer for Fenner Dunlop BV (Dunlop Conveyor Belting) in The Netherlands. Who else wants a productive and effective meeting? Death by meeting. That may be the cause of death of many a business leader and a lot of corporate folks. Seriously, one important item that gets overlooked by the vast majority of meeting facilitators is the meeting room set up (Click to tweet this). How a meeting is supposed to feel to the attendees should be on your mind. Seating arrangement, temperature, food, drinks, rest room access, etc impact how your attendees feel about the presentation / work shop you are trying to hold. Ever tried holding a speech in a stone cold room? Good luck with that one. Effectiveness is largely driven by how people either face their team members or the facilitator. A class room setting will not work well if you want the team members to have a communication for interpretation or understanding. It just does not feel right. It is these little bits of micro level information that provide each meeting attendee either with congruence to the meeting topic, or they mentally check out. Congruence is what you want to shoot for. There is a direct connection to your own personal brand and that of your company and the impression the meeting made on each team member. It really does not take that much more time to plan this out ahead of time. In the download section please find a meeting room planning guide (there is also a meeting planner). Have fun experimenting with the different set ups. As always, please pass this info along to your friends.